Model T Ford Forum: Youth guess how old a model T is. Youth guess how old a model T is. Model T Ford Forum: Forum 2018: Youth guess how old a model T is. I told them their job is to figure out how old (what year) it was before I got back out of the house. So tell me what you think there guess was. If they looked very close, they could have seen your 1926 license plate. "What's your guess?" Is my stock response when someone asks what year is the car I'm driving. Answers are all over the map but 1970s and 1980s come up surprisingly often. Actual years are 1912, 1924, 1926 and 1947. Probably guessed 70's. When someone ask how old my '27 is I tell them that Smuckers sponsors a segment on the "Today Show" every day of people who are older than the car! That usually throws them for a loop. About thirty years ago a young lady I worked with told me her uncle had a car that was really, really old, but she didn't know what it was. By the next day she had found out. It was a 1968 Nova. So it would not surprise me if the boys guessed eighties or nineties. What has me mystified is that several people, seeing my 1915, have asked, "Is it a 34?" Huh? It doesn't surprise me that they would be way off in their guesses, but it seems weird that they would all pick the same wrong year. I'm thinking they thought it was older than it was. My wife is a middle school teacher and last year one of her students told her she saw her husband "driving around in a like 200 year old car. "(my 1915 runabout) I should probably have a talk with the History department at her school. Our local community picnic night before last featured a car show . . . About nine or ten beautifully turned out cars, the oldest was a '55 Buick Roadmaster. It's all relative - when I was 14, a 63 year old car was an 1899 model, and there were none to see ! The "really old" cars that interested me were 35 to 50 years old. In the mid-eighties I was on a school trip to a museum and one of the activities was Model T rides. An old timer had his touring car there and was making the rounds. I leaned over to him and asked, "is this about a '24?" He absolutely couldn't believe that I asked him that and that I was correct on the year. He said that I must have overheard him tell someone else. It kind of made my day...and it was a pretty good guess. Well, Did I win the jar of pickles? We have to remember that 8 track, VHS tapes, record albums, and flip phones are REAL OLD to kids under 20 these days! But I guess there is hope for folks who like old things. There is a growing group that's collecting VHS tapes and shows for VHS collectors. I guess I'm behind the times! 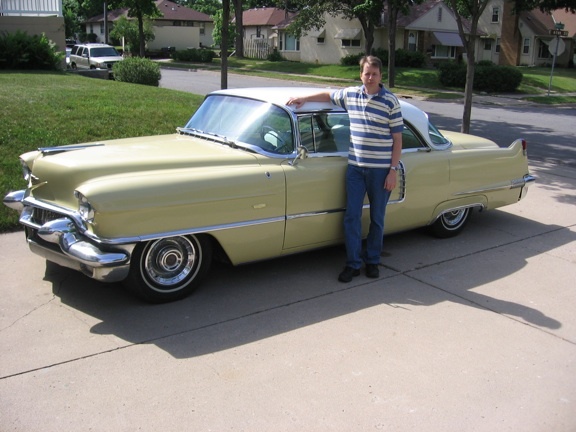 My grandmother drove this 1956 Cadillac Sedan DeVille until 1980 when I was still in high school. At that time driving a 24 year old car in Minneapolis for regular transportation was rare so this car really stuck out like a sore thumb. Today, driving a 24 year old car is pretty common. The car still exists - she sold it to a neighbor. This photo of me with the car was taken in 2008. For several decades now it's been common for young folks to know nothing that happened before they were born. They instantly recognize some "celebrity" who is famous for being famous, can recite the unintelligible words from a rap "song", and may even know who the president is. But they have no clue about Jimmy Carter, George Harrison, or Julie Andrews. It's not stupidity. It's just that historical knowledge and perspective are considered boring and unimportant. 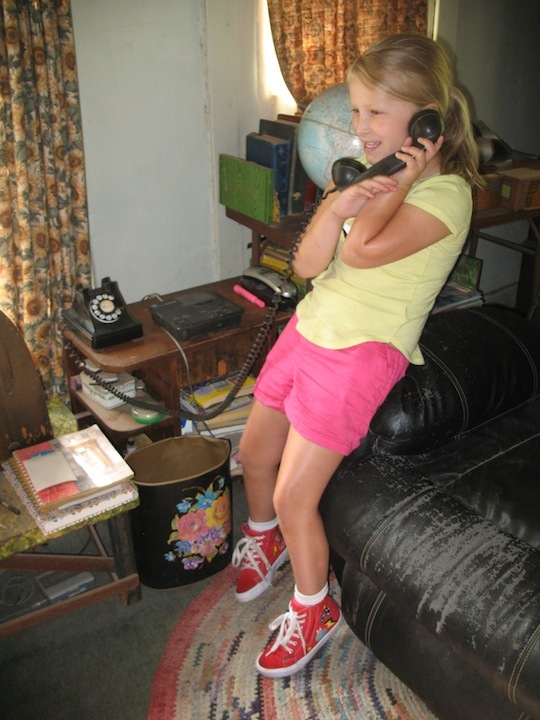 History in action: Ripley receives a call from her mom on the dial phone. Aren’t all them old cars 1932 models? I’m often asked if my ‘29 Nash is a 32. My wife and I were sitting at at stop light on 4th of July about 4 years ago when a couple of young guys pulled up beside us. A guy in Oakland guessed my ‘48 Nash as 1906! Quite often I get folks guessing around 1944. I tell them there was a war going on and the nation was not making cars those years, but that they were close. Is they do guess the right year I usually ask, “What month”? They still allow you to have rotary dial telephones in Kansas? Heck, I have two rotary dial wall phones in use here, one in the shop and one in the train room. I don't use them to call out anymore, I don't know if that part will still work! Only problem is, I can't tell if the incoming call is a telemarketer or someone I really want to talk to. BTW, that looks like an old Stromberg-Carlson. . . So, Ripley received a call from her Mom on the rotary telephone; did she believe it or not? I have had adults guess my ‘17 Touring as being from the ‘30s or ‘40s. 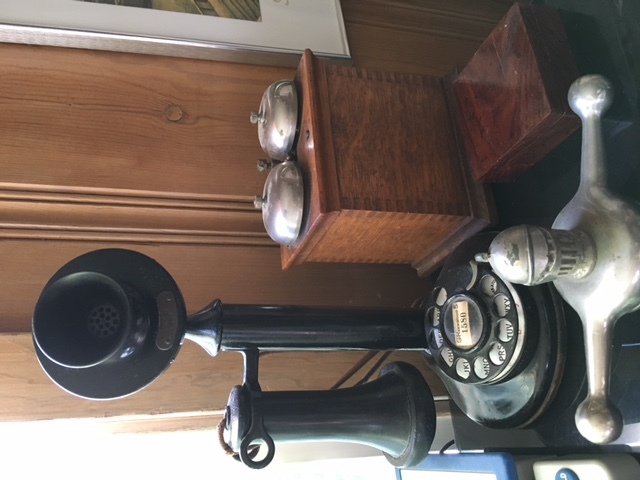 The phone in the photo is a Western Electric 302, the common desk set used from the early forties up until the introduction of the standard 500 set. The 500 rotary dial set was used until the introduction of Touch Tone dialing in the early sixties. Note: dates are somewhat approximate as I'm going by memory here. Yes, I'm an old retired phone man! I don't know about the rest of the nation, but here in California the law requires that modern ESS (electronic switching systems) must still accommodate a rotary phone. I'm luckier than most in that my three sons all have a solid grounding in history, politics and....wonder of wonders.....cars! George, in addition to the $2 bills, get some $1 coins. Pay with combinations of the bills and coins. This has been dubbed an urban legend, but it's actually pretty believable. 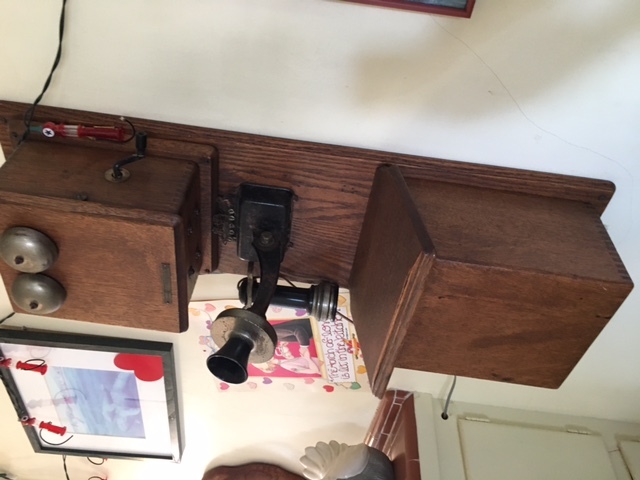 Rotary phone use in Kansas depends on your carrier. I'm on Cox, so I can receive calls, but to call out I have to use a push button phone. I believe AT&T customers can still make rotary calls out. I spend twos, dollar coins, and halves all the time. One reason is the entertainment value. Twice this year when I was buying movie tickets the youngsters have had to stop and ask their managers if they're allowed to take twos. There are pulse to tone converters that you can hook up to a rotary phone. Some of the vintage/antique phone supply companies sell them. Also, another workaround is a keypad that you hook up to the line between the phone and the phone jack. I had a guy confidently ask me this morning if it was a 1904. I told him, “I wish! I could trade it for a house!” but made sure to explain black-era T’s like mine are well within the reach of ordinary people. I had my 24 Fordor in a car show and a boy about eight and his sister about five were looking at it and the boy with his older and wiser knowledge told his sister that's the way the made them back in the 80's he couldn't comprehend 1924. If I ever get up that way again, I'll have to look you up. I still use my WE dial candlestick here in Calif. I don't have the ringer box hooked up, but the "new" phone rings so don't need it. Gives you that old fashioned tinnyness when you use it. I also have a Strongberg Carlson double box that is working to. No dial, only for answering. Someone was looking at our '21 Touring at the gas pumps one day and ask what year it was. When I told them 1921 they said "that was one of the first year that cars were made, wasn't it?"